I'm really intrigued. The game allows you to add more teams, which looks quite interesting. I am strongly in favor of creating a mod, and will try to help in finding the missing data. 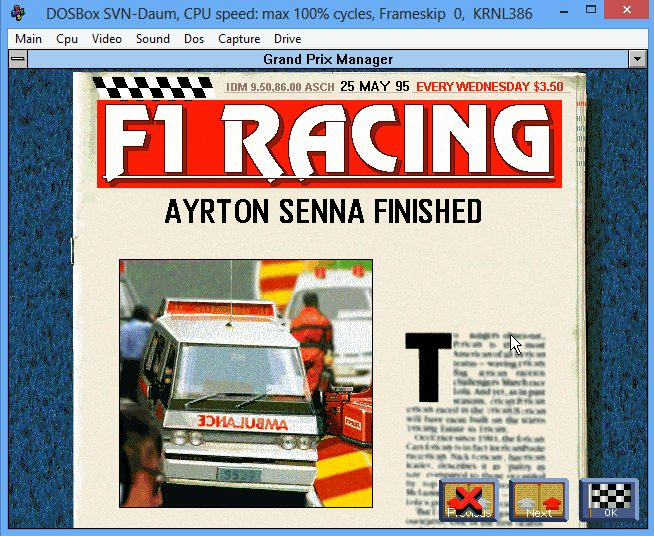 So far I managed to find the calendar in the executable file, the nationality of the main drivers and some data of the tracks. The game allows you to add more teams, which looks quite interesting. At least in the qualification involves all 32 cars. 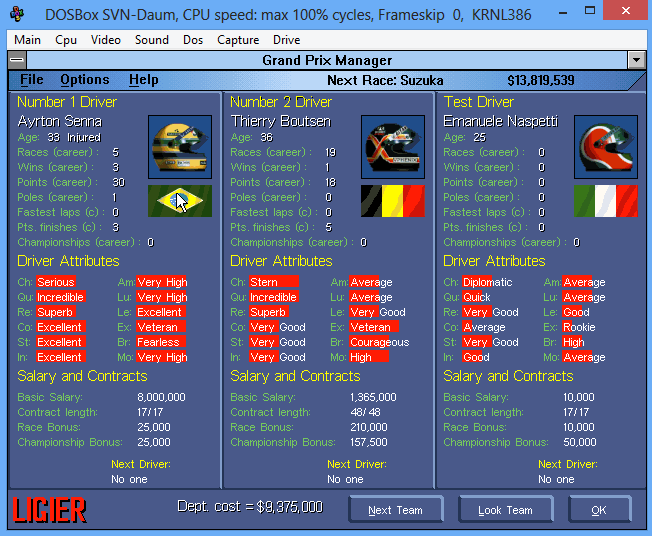 DNPQ wrote: The game allows you to add more teams, which looks quite interesting. 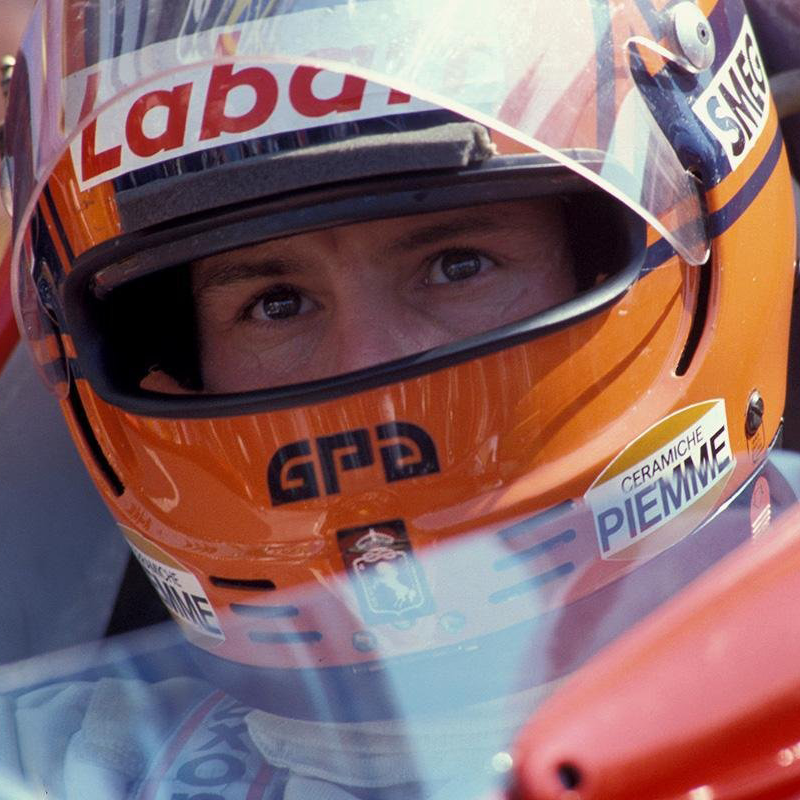 Nice to see there is some interest in modding the game, and that DNPQ has even made some further research! Finding even bits of data helps a lot, as I can usually figure out the pattern once I know where to look. For example, the GPM2 bookmarks I initially received from IanWoollam only contained the data for a couple of tracks; I had to figure out the rest myself. I've been a bit too preoccupied to work on GPM1 at all lately, but I have a week-long holiday coming up in a couple of weeks. I'll see what I can do during that time. OK, how to install Win311 in ORACLE VirtualBox? I've tried on DosBox and it didn't work. Obviously if someone, somehow reverse engineered the game and made it compatible for both 32 and 64 bit OS, that would've been awesome, but none of us here has the programming skills required to do this. Also is it possible to run the game on 32-bit Linux OS? 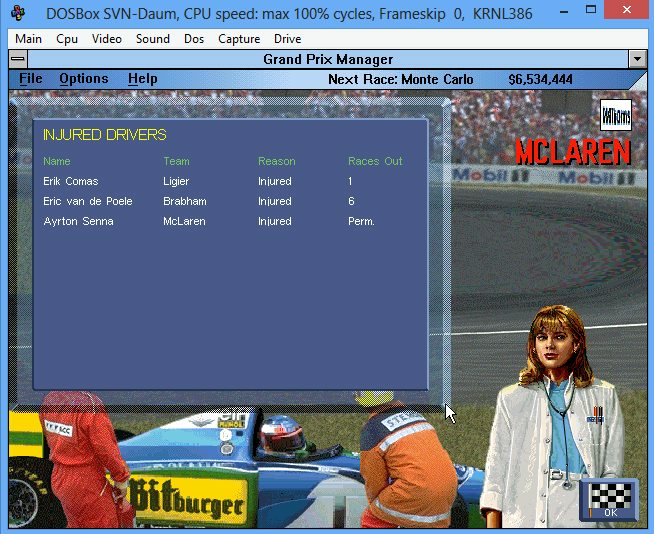 It turns out in the game the driver can get permanent injury, and no longer participate in the race, although the AI will try to enter into a contract with him. GPM2 has the same functionality, but it's glitched - by the start of the next season the "permanently injured" driver is completely fine. 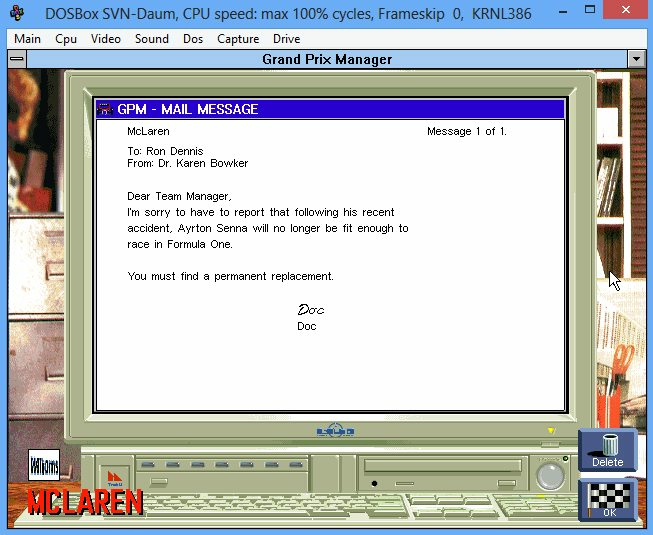 DNPQ wrote: It turns out in the game the driver can get permanent injury, and no longer participate in the race, although the AI will try to enter into a contract with him. That's a soft way to tell you "he died", to be fair. Not really, I hope the developers made it based on Pironi's & Laffite accidents, where both of them broke their legs and, well, never came back to F1.